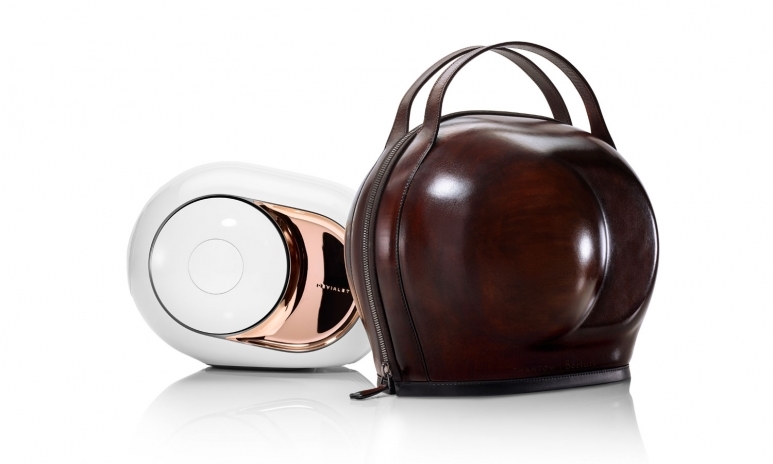 Having revolutionised the world of high-end audio in 2015 with their Phantom wireless speakers, Devialet have now announced an exclusive collaboration with Berluti to produce a truly unique travel case for Phantom, named Cocoon. Since its launch, Phantom has been widely praised by audio enthusiasts and influencers alike for its hybrid analogue and digital sound system, producing unparalleled audio quality. In 2016, Devialet upped their game with Gold Phantom, a new speaker eight times more powerful than the original with a 22 carat rose gold-plated finish. For 2017, Devialet and Berluti have designed an exclusive travel case tailored for Phantom. Exemplifying style and sophistication, the Cocoon is crafted with fine Berluti Venezia leather in a Tobacco Bis shade, with added natural pigments that create depth and richness. “It’s about a crossover between an ultra high [end] tech product and a timeless, classic brand, just like remixes of classic [songs],” says Hong Kong DJ Ivan Sit. Both Phantom and the Cocoon can be custom-patinated in the original Tobacco Bis hue or darker shades such as Nero or Indigo. Just 25 Cocoon cases will be sold within the Asia Pacific region. The Cocoon will be available exclusively at Devialet ifc mall from March 30 for HK$19,000 apiece. Phantom is now sold in selected Apple Stores, as well as Devialet stores around the world.